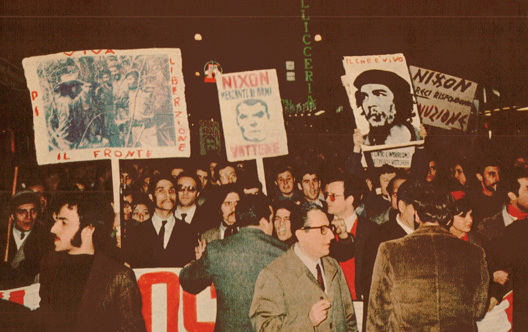 Not everybody was wild about Nixon coming to visit, especially Rome. News on this Washington’s Birthday in 1969 had much to do with the anticipated European visit of newly inaugurated President Nixon. It also had something to do with a just-published biography of George Washington by author-historian Mary Higgins Clark, and revelations over what were previously conceived notions as to who the Father-Of-Our-Country really was. But the news began with reports on the upcoming Nixon visit and how people felt about it. News from West Berlin disclosed a newspaper report the East Berlin authorities would be willing to permit Easter East-West Berlin visits, if West Berlin decided to drop the notion of elections in West Berlin in March. Visits were cut-off in May of 1966 and not resumed. No comment from the Bonn government. The Soviet Press went on to say the West Berliners were deliberately trying to stir up tensions between the Soviet Union and the U.S. by holding the elections. Reports from France also denied French President DeGaulle was planning on introducing a plan that would disband NATO and the European Common Market, replacing it with a Four-Power alliance that would include France, Britain, West Germany and Italy, but exclude the U.S. The French Press Office blamed the British Press for starting the rumor. Meanwhile, in Vietnam – 48 B-52 bombers targeted suspected North Vietnamese positions north of Saigon, dropping some 1400 tons of explosives in the process. The Tet holiday ceasefire also ended today and fighting went back on schedule. Some 15,000 West Virginia Coal Miners went off the job in a wildcat strike over the lack of Coal Industry involvement in doing anything regarding lung disease prevalent in mining operations. And an interview with Historian-Author Mary Higgins Clark revealed that much of what the country knew about George Washington was actually made up by a traveling minster who didn’t really know the President at all, but his colorful stories were repeated so much they became legend. The infamous Cherry Tree incident was a fabrication. Martha Washington was, for all intents and purposes, a hottie and not the middle-aged dowager she was portrayed as. She was also never called Martha, but rather, Patsy. And George, it was learned, was quite the snappy dancer. Little known facts, for this Washington’s Day in 1969 as presented by NBC-Monitor‘s News on The Hour for February 22, 1969. Wendell Wilkie on a fact finding mission from the U.S. – grim but resilient. News for this last day of January in 1941 was a continuation of what had been going on months earlier. Continued daylight air raids over London and other industrial cities in Britain grew more vicious, but didn’t seem to daunt the resilience of the British people as the War went into its 520th day. 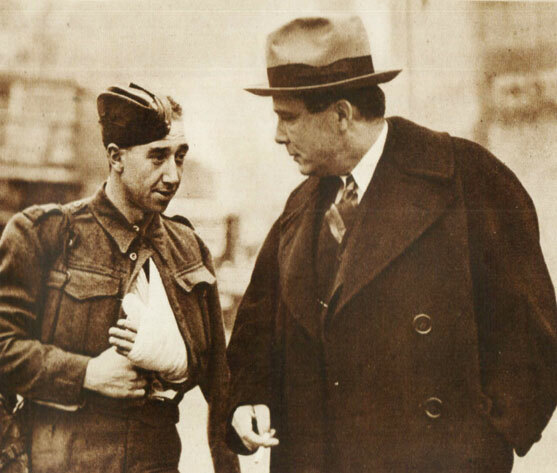 Former Republican Presidential candidate Wendell Wilkie was on a fact-finding mission in Britain, touring defense plants and bombed out cities, getting a first-hand view of how Britain was weathering the War. Meanwhile in Germany, Hitler had delivered another of his “confident and contemptuous” speeches to the German people, monitored and reported on in Britain the night before. Seen as more of a pep-talk for a nation growing weary of the war and interested in a “quick peace”, it was noted that Hitler was now threatening the U.S. and this was seen as not a good sign on Germany’s part. The financial cost of the war was a topic of discussion in Parliament, with reports that Britain alone was spending $36 million per day and calls for new loans were being considered. From Rome came reports the Italian Army had abandoned Derna in North Africa, escaping the risk of being surrounded by British forces advancing in that region. From Berlin came reports on reactions to Hitlers latest speech. It was noted that Hitler had taken to using irony and sarcasm in his speeches more now and it was also noted that his threats to use force against U.S. ships coming to the aid of Britain were seen as a more heated warning against U.S. involvement in the war. No mention of an imminent invasion of Britain anymore, but a stepped up campaign of U-Boat attacks on British shipping. From Capitol Hill it was reported the thinly-veiled threats toward the U.S. contained in Hitler’s speech served to cement Congress’ resolve to pass the new Lend-Lease Bill, continuing shipments of aid to Britain. It was also learned that Siam (now Thailand) was demanding the Vichy government of France hand over the colonies of Indochina and Cambodia and eventually relinquish all colonial stakes in the region. All that, and a lot more for this January 31st in 1941 as reported on the NBC News Of The World and News Of The World Night Edition. Laos – January 1961 – Writing on the wall, harbinger of things to come – you name it. Four days after his Inaugural and six days before his first State of The Union, President Kennedy was already presented with a full plate of crises, this January 24th in 1961. Moscow‘s gesture at returning captured U.S. flyers, coupled with increased tensions in Laos, the situation in Cuba – the unsettling European financial situation brewing, the situation in the Congo – all of these presented enough challenges to occupy the White House for a good long time. But then there were domestic issues to deal with. Strikes within the Defense establishment were cause for concern on Capitol Hill, our own economic woes weren’t going away anytime soon. And all of that on the first official meeting of President Kennedy’s cabinet, who had been sworn in only two days earlier. A full plate indeed – and a plate only destined to become overflowing in the weeks and days ahead. And that was The New Frontier as reported and analyzed by NBC Radio reporters on January 24, 1961. ” . . . .and rising”. 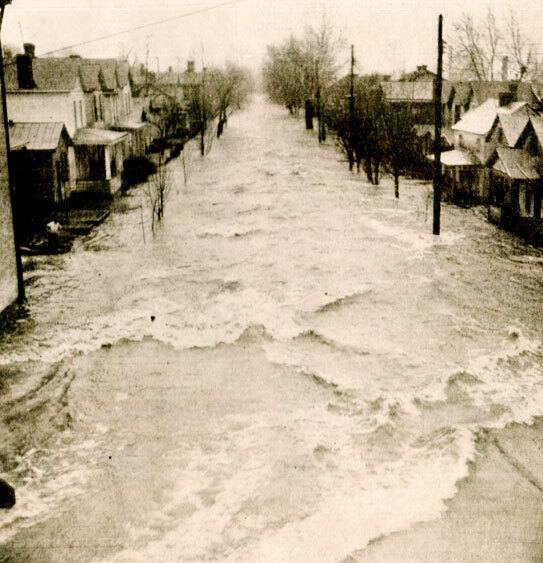 This day in 1937 was horrific if you lived anywhere near the Ohio River. Rains continued without stop and flood waters continued to rise. The devastation was widespread and the numbers of homeless were growing by the minute. In an effort to keep the public informed, that relatively new medium of radio was called on to report the disaster as it was happening and to act as a public service to people in the affected areas. This was one of the first instances of on-the-spot reporting done by radio. The speed by which reports and warnings were given probably saved countless lives in the process. And even though the rising waters were knocking some stations off the air, it still provided an essential service and kept the rest of the country informed, and glued to their seats. Just another January 23rd in history, as told by a group of radio stations all along the NBC Radio network as it was happening. A milestone for Women in the U.S. that’s still a point of argument 40 years later. Forty years ago today, the Supreme Court handed down a decision that made a Woman’s right whether or not to choose to have an Abortion a legal right. Prior to this time it was illegal for a doctor to perform an Abortion under any circumstances, and those Women who chose to have an Abortion were forced to pursue methods that were not only unsafe, they were often times deadly. But since this day 40 years ago, the debate continues to rage. The question of a Woman’s right to choose the destiny of her own body seems to have come into question by those, not with the proper physical parts to make that decision, who would like to revert back to the old days and dark ages. And those people, many of them, have taken it upon themselves to resort to violence under the somewhat hypocritical banner of “Right to Life”. An Epic Fail of logic . . . just sayin’. Here is that initial report as broadcast over The NBC Nightly News for January 22, 1973. 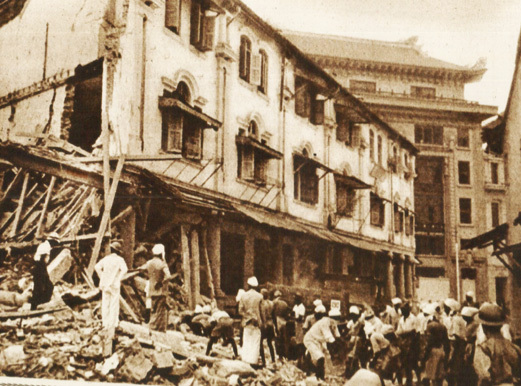 Singapore – January 1942 – endless bombings and looming invasion. News for this day in 1942 was hopeful and grim, in equal portion. 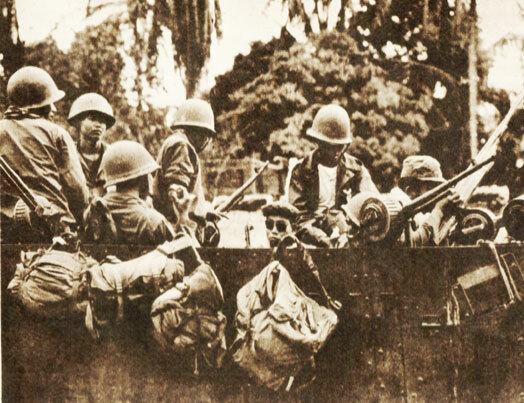 The Battle for Singapore was on and fighting was taking place all over the Far East. In Mexico, the government announced it would no longer grant citizenship to German, Japanese or Italian nationals. A censorship office for U.S. Mail had been established in Miami since so much mail from South and Central America and the Caribbean passed through the terminal in that city. On the Eastern Front – reports from Germany claim the line in its invasion of Russia had been stabilized, whatever that meant. Later reports claimed otherwise with Russian advances taking place on several fronts. It wasn’t clear who was giving accurate assessments, but there was the infamous Russian Winter to take into consideration. London reported RAF bombers staged their largest raid so far on Germany overnight. In Washington, noted Aviator Laura Ingalls ( not to be confused with writer Laura Ingalls Wilder) was arraigned in Federal court on charges she failed to register as a German Agent. She was arrested by FBI agents on December 17th and held on $7,500 bail. And a bulletin received during the newscast reported Australian troops on the West Malaya front wiped out a Japanese tank and infantry column during a pre-dawn raid. All that, and a lot more via these Overnight news updates from WJZ Radio on January 16, 1942. New Years Day in 1945 was pretty much “business as usual” during World War 2. Although the Allies were making substantial gains in their drive into Germany. 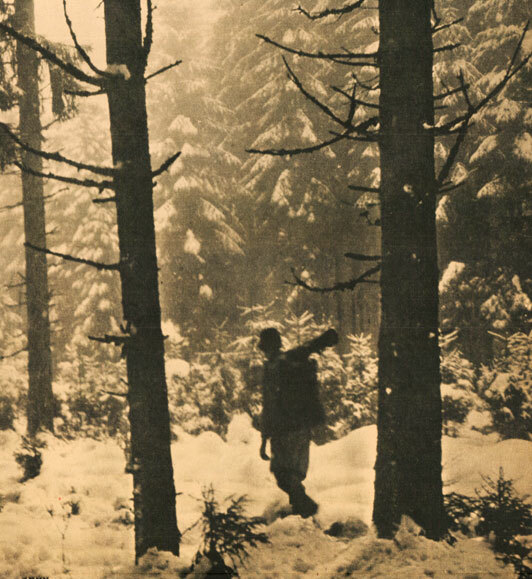 The infamous Battle Of The Bulge that went on just before Christmas was now in the mopping up stages, with any gains the German Army made during that period of time now lost and regained by the Allies. And the war was continuing without let-up on all fronts. But it was a general feeling that the war would be over sometime in 1945. At least it was hoped. Here is the news for January 1, 1945 as reported on News Of The World over NBC.